Claire Priestley, Director of Information Technology at City, has been crowned Future CIO of the Year at an event celebrating the IT industry’s highest achieving women. The Women in IT awards is an annual celebration to showcase the achievements and innovation of women in technology. The aim is to create new role models and promote diversity to tackle the gender imbalance in the IT industry. Claire was nominated by a colleague at City for the successful changes she has made since she joined in 2008. She was shortlisted in October last year and announced as the winner at the ceremony in January. The judges selected Claire in recognition of the way she has improved processes at City to make them more efficient and cost effective and for creating a culture that is both high performing and highly participatory. The judges were particularly impressed with all Claire has achieved while working in Higher Education, a sector where budgets are typically more limited than those in the corporate world. “There are many reasons to strive towards a diverse workforce within IT,” Claire said. Our ability to connect and engage with anyone – regardless of their background, style or culture – is a crucial part of inclusivity and makes us a richer, more rounded and effective department. Technology as a profession remains notoriously imbalanced in terms of both gender and BAME diversity and whilst our department is ahead of the industry averages in terms of gender and BAME representation, we still have lots of room for improvement. The winners were announced at an event organised by Information Age, the UK’s leading business-technology magazine. During the ceremony, Alex Younger, Head of the Secret Intelligence Service gave a keynote speech highlighting the need for diversity in the industry. 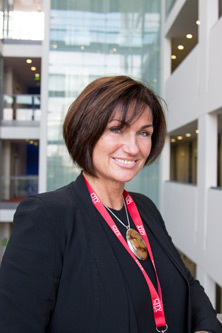 I am delighted to have the opportunity to demonstrate my support for an event which recognises the outstanding contribution by women in the IT industry, a contribution I am determined to grow and enhance in the Secret Intelligence Service to make us the best we possibly can be in utilising talent.